Here's a close-up from a larger image that showcases the details contained inside. I know everyone doesn't zoom in, so this would appears a little better in the stream. Even still - view large and zoom in! 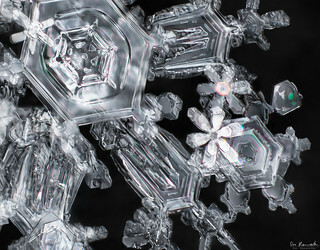 While large snowflakes can contain plenty of cool features, don't under-estimate the little guys! 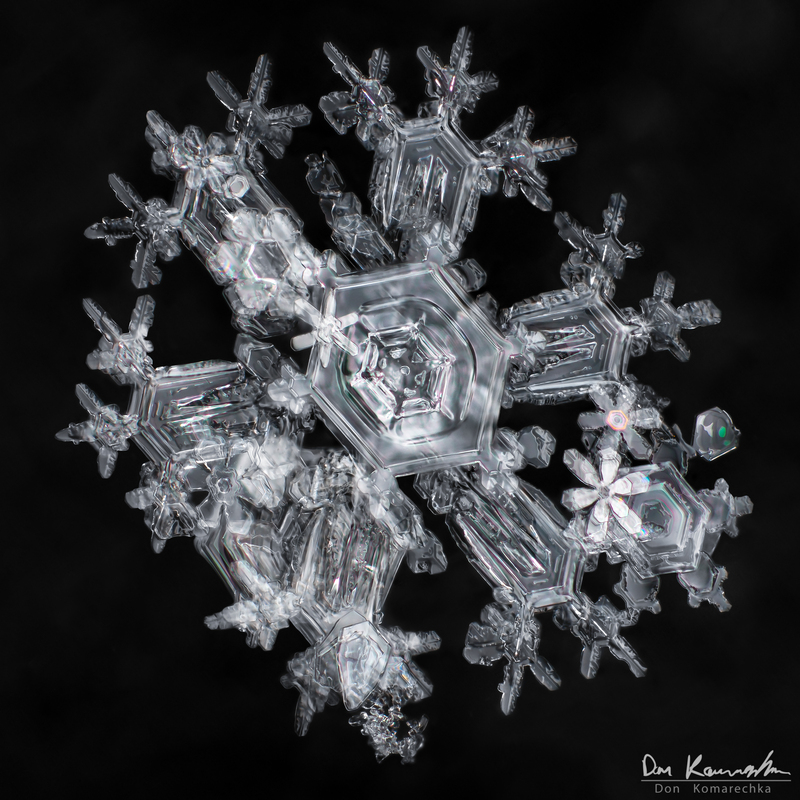 Regardless of size, these ice crystals all bring something interesting to the image. The largest snowflake is a "double decker" design. It's growing on two planes connected by a "skeletal form" type of interior. This can happen when a hexagonal plate grows cavities on the thin sides due to the branching instability, and those cavities normally form bubbles. In this case, they split the crystal into two new halves, each becoming their own branched plate. They're still part of the same crystal, but can have very different growth patterns. The right side of the image contains some colourful bits, with colour caused by both chromatic aberration (very slight green and magenta colours) as well as thin film interference. The thin film interference is the most interesting, creating some of the more vibrant colours... such fun to capture the details of images like this!